Wargaming announced they are going ahead with the previous changes to Object 263 branch at Wargaming Fest. Miloš Je?ábek recently stated he wouldn’t be replaced and he was right, it’s not replaced if it goes down one tier and Object 268 v4 is introduced as the new Tier X.
I’ve many times voiced my voice against these changes and offered a possible alternative, like many others already have. The problem is that Wargaming is going to replace a high DPM Tank Destroyer for yet another high alpha one, similar to Object 268. Even by reducing the alpha damage from 750 to 650 per shot, the tank feels the same but with a rear turret placement. 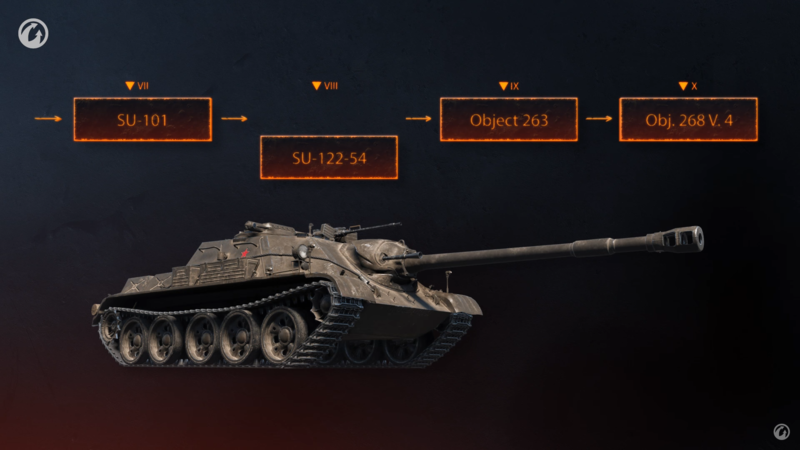 If a new Tier IX was introduced, replacing SU-122-54 as it doesn’t fit the branch, players could then choose in between Object 263 that fits the exact same gameplay, lower alpha damage with high DPM, or Object 268 v4 that offers similar gameplay but high alpha damage with low DPM. Either Wargaming doesn’t seem to want to hear the community or the most plausible solution is that they can’t find a good enough tank to fit Tier IX, making the announced changes an easier choice for them. Nonetheless, we Community Contributors received a more in-depth explaniation for all the changes. Boosting gameplay variety with new rear-turret heavy tanks we’ve been working on supertest server. They offer an interesting take on HT gameplay, which is not currently available through other top-tier vehicles. Not to mention their design and the fact they’re all modelled off tanks that have seen their share of action. Fixing the lines of Soviet rear-turret/superstructure vehicles on both the medium tank and tank destroyer lines to deliver a more logical progression to top tiers. These vehicles were totally mixed up in between the tech tree lines: rear-turret/superstructure vehicles were mixed with other vehicles with a more conventional layout and vice versa. As a result, the gameplay was varying a lot from tier to tier, which caused a lot of frustration and seriously undermined the lines’ popularity. They played oddly, so it’s not surprising only few people wanted to research the line and/or play in them. To sum up, these vehicles are meant to drive the breakthrough of the flanks. Outstanding mobility lets them quickly reach and occupy key positions and hold them until allies catch up. They specialize in mid and close-range combat. They can pop out from the cover, deflect enemy shells, and send a few solid punches in return before quickly retreating back to safety. Moved the Object 263 down a tier enabling it to make a sensible contribution with its damage per shot and armour. At the same time, this re-shuffle stopped us from increasing to make it fit for a Tier X. With these changes, we felt we almost reached our goals but were left with the SU-122-54 that just didn’t fit into the concept because of its traditional turret placement. It was clearly out of the line in terms of gameplay but was valuable from a historical point of view. As an interim solution, we decided to test it as a Tier VIII to see if it can be viable there. Unfortunately, it was just as unimpressive at Tier VIII. It was no good at blocking damage even at tier VIII and still felt like a huge step away in terms of gameplay. The Object 263 and Object 268 Variant 4 showed excellent results in the tests. The vehicles perfectly blocked the damage and performed as assault TDs–fast, armoured with an average damage per shot and not very big DPM for TDs. You spoke out against moving the Object 263 to Tier IX, but the testing result told us the opposite. The Object 268 Variant 4 proved superior to Object 263 and therefore better suited for the role. So we took them both for another round of testing to verify the initial results. Reduced the Object 268 Variant 4 alpha strike from 750 to 650 to maintain the uniformity of the gameplay in the line. There’s no abrupt change in alpha damage and reload time now, when you move up from Tier VIII to Tier X. The 2nd test solidified our belief that these vehicles demonstrate a very interesting type of gameplay. They aren’t OP. Their average damage per shot is lower than that of classic TDs but still higher than that of heavies or mediums, which prevents them from having a huge DPM. This was intended as we did not want to create fast, armoured vehicles able to deal the same amount of damage as regular TDs. We believe that the final setup will provide a fresh take on TD gameplay, and invite you to take the revised line for a stroll during the upcoming Common Test. Give them a shot, try to keep a somewhat open mind, and let us know what you think! We will monitor these and other revised Soviet tanks to see how the tuning adjustments are working out in real live server condition, and if further iteration might be needed. Last but not least, we strongly recommend you to follow our official channels for communication on all re-balancing work being done in order to get the latest and most accurate information on changes to come. We will on our end double our efforts to keep you updated on the reasoning behind the changes we make to the tanks you play and love. One thing they could do if they REALLY want to do this, is to do a tiny mini-branch with the SU-122-54 in the same way they already have the KV-13. 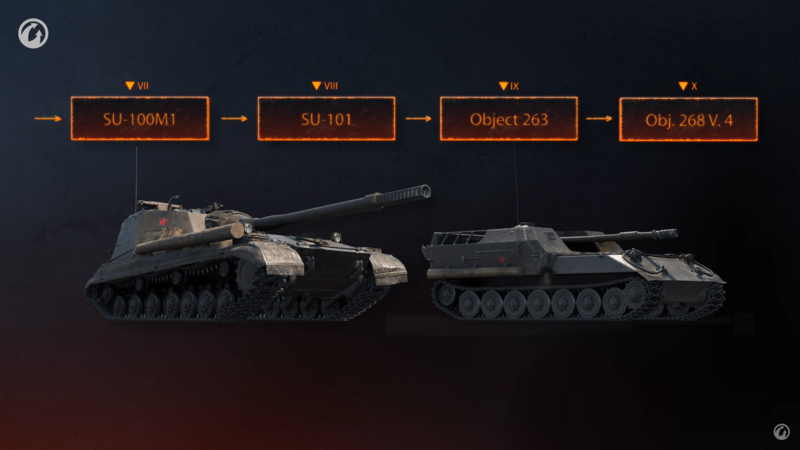 They could put the SU-122-54 at tier 8 – or keep it at tier 9 – and have it split off from one or BOTH of the TD lines. This would keep variety of tanks in the game as high as possible whilst not removing a viable tank that was one of the few in these TD lines to have actually been produced in any number greater than just prototypes and as such would then keep the argument that people have against blueprint-only, prototype-only or even completely made-up tanks, to its weakest. So, in Q&A, they said that they “listening” to player’s feedback and they won’t downtiering the 263.
but after 1 week later, they announced that they gonna continue the plan again. No, they actually said they weren’t REPLACING the 263. They are trying to get out on a technicality. And that is only your opinion. WG really is stupid. Object 263 was the oly thing which I wanted in that line. I didn’t grind it not because of that tank but because of terrible tanks that preceed it. Object 263 was literally the only thing that didn’t need fixing in that line. “… a lot of frustration… seriously undermined the lines’ popularity. They played oddly, so it’s not surprising only few people wanted to research the line and/or play in them. This seems like a bone headed move. Big bang/ long reload OR little bang/short reload. Don’t take the worst features of both and expect players NOT to be frustrated. Another low pen, slow reloading soviet 122mm would doom this line immediately. Put the Obj 268 v4 as an alternative Tier X that can be researched through both TD line’s Tier IX tanks, a bit similar to the 113 and WZ-111 5A line. Since they’re so stubborn and still want the Obj 268 v4 to be Tier X, then this is the only way that everyone can win. The idea isn’t bad, mind you – but removing the accuracy and DPM benefit? Increasing the armor? If you wanted to make them into heavy tanks, then at least give them a damned turret. There is truly no difference between frontal, mid and rear fighting compartment if you lack a turret anyway – you can’t sidescrape neither can you peek around a corner. 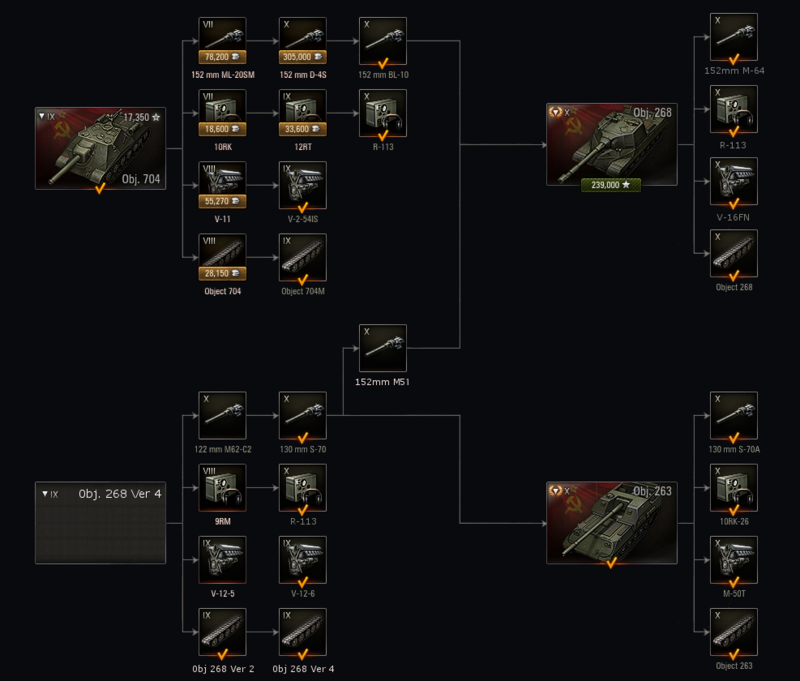 – keep the Obj 263 at tier 10? Because Obj 268v4 at Tier 9 isn’t feasible? Also, SU-122-54 is front gunned, not rear like the rest of the branch. i’m sure they can make the v4 fit at tier 9. Agree with the 122-54 not fiting in the line, however, the only thing that agravates people and needs to be avoided is losing the 263 from tier X.
these changes just show how wargaming don’t give a crap what we say and how the game is going down hill they want to take everything good about the 263 and remove it . the dpm the mobility when turning and the view range. what a joke just another reason not to play wot anymore . either wargaming will listen to us or they will choose to ignore us. I really think they had a huge opportunity here to show us what we say mattered and they did a sneaky QA and now they going to screw us anyway. I say if they do these changes everyone just don’t research the new tank and boycott the premium shop . This is an amazing example of why people get so pissed at wot devs bc nothing we say matters EVER. Just more proof that wargaming are greedy liars . Ask yourself why they are willing to piss so many players off when all they have to do is add the new td to the line as another tank to play that would make everyone happy . ffs wargaming just add it and call it a win for everyone. plz . Keep sending tickets and posting on the forums telling them we don’t want these changes.